A new wave of strike action is likely at the BBC as its director general Mark Thompson prepares to announce up to 3,000 job cuts. 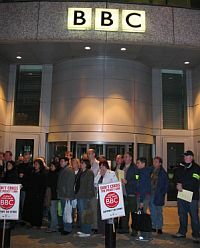 Staff yesterday claimed morale was lower than at any point since John Birt's directorship as union leaders met the BBC Trust chairman, Sir Michael Lyons. They warned him that industrial action in the run-up to Christmas was "inevitable" if the BBC pressed ahead with plans to cut thousands of jobs in an effort to plug the £2bn "black hole" between its stated ambitions and its below-inflation licence fee settlement. On Wednesday, Thompson will present proposals to the BBC Trust that will result in between 2,000 and 3,000 redundancies, although between 800 and 1,000 new jobs are also expected to be created. News and factual divisions are expected to face the most cuts, as closing BBC3 has been ruled out, and non-production areas have already been targeted in the past. Broadcasting union Bectu and the National Union of Journalists said cuts would lower quality of programming and result in new hires receiving worse conditions of service. The news comes just three years after around 6,000 jobs were axed or outsourced in an attempt to save £355m a year by 2008. These new measures would mean a 12% overall cut in staffing over a period of as short as 12 months. The Factual division (Newsnight, Horizon, the Money Programme etc.) may be cut up to 25%, and around one hundred BBC news staff have signed a letter of protest including John Humphrys and Jeremy Paxman.